Reports that Yoko Ono took part in the eating of a cooked corgi during a live radio show have been exposed as a hoax. 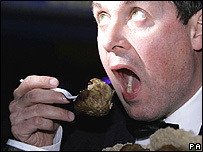 It was reported on 30 May that Ono watched performance artist Mark McGowan consume a dead dog on London radio station Renaissance FM and tasted what he was eating. But she was not, as reported in an earlier version of the story, in the studio at the time, having flown to Russia for the opening of her Moscow Biennale show. McGowan, a vegetarian, said he staged the stunt to protest over the Royal Family's alleged treatment of animals. A fox was reportedly mistreated during a hunt led by Prince Philip in January, though the RSPCA said it did not suffer. McGowan described the corgi - which he said had died at a breeding farm - as "really disgusting". "It's stinky, it's white-looking, it's not like any meat I've ever seen," he continued. Viewed "as an art piece", though, he considered his unusual meal "exhilarating". However, presenter Bob Smith said he was not convinced the meat - reportedly cooked with apple, onion and seasoning - actually came from a dog. McGowan's previous stunts include leaving a tap running in a gallery to highlight water wastage and using his nose to push a peanut to Downing Street to protest against student debt. A spokeswoman for People for the Ethical Treatment of Animals (Peta) said she approved of his latest shock tactic.